For this boxing fan, meeting Manny rates ahead of meeting Marty. 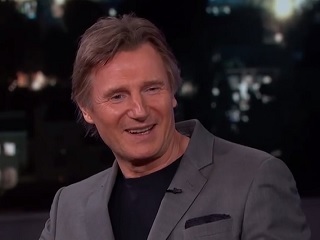 A couple of noteworthy things happened last night on Jimmy Kimmel Live at the outset of Liam Neeson’s appearance in support of Run All Night. Firstly, Manny Pacquiao was in attendance, goofing stage-left with Guillermo after a press conference earlier in the day at LA’s Club Nokia promoting the May 2 bout with Floyd Mayweather. As Neeson explained, even though he narrated the 2014 Pacquiao feature documentary Manny, last night in Hollywood was the first time he met the Filipino superstar. Neeson, a huge boxing fan, confessed that in that moment he was genuinely nervous. Neeson said he hopes to be in Vegas for the big fight, provided he can get away from a movie shoot scheduled through the end of April in Taiwan with Martin Scorsese. This is the second time Neeson has worked with the famed director; when Kimmel asked whether the first time, Gangs of New York, was a “dream” and “like meeting a hero,” Neeson was refreshingly frank. The best part of that chunk of the conversation is Kimmel’s delight in Neeson’s answer. When you’ve heard as many rote industry cheers as this Jimmy has, it’s nice to have an A-list guest straightforwardly change it up. That portion of the conversation starts above at the 1:45 mark.